As the Calgary Flames continue to evaluate their options for this summer, including evaluating coaching candidates and preparing for the impending June 2012 Entry Draft in Pittsburgh, one pillar of support in the organization is likely relaxing from another lengthy, bittersweet campaign. Goaltender Miikka Kiprusoff is, as of this moment, very likely enjoying his time away from hockey in his native Finland. 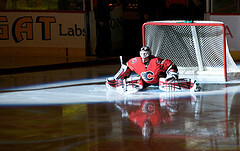 While not hermit-like, the Flames goaltender is a very private person and clearly values his breaks from the game. That should come with little shock as Kiprusoff is not only one of the best goaltenders in the league but is also one of the most played. In each full season that he has spent with the team, Kiprusoff has averaged 73 games per season and has never played less than 70 games. To say the Flames rely on Kiprusoff is an understatement of his efforts and an excellent case can be made that the flashy Finn has been the most important Flames player over the last 8 seasons, even more so than Jarome Iginla. While the overall success of the organization has been limited to first round playoff exits since the Cinderella Cup Final run in 2004 it is no surprise that the largest team accomplishment of that period, the 2005-2006 Northwest Division Championship, coincides with Kiprusoff’s only personal major awards- the 2005-2006 William Jennings and Vezina trophies. Kiprusoff was electric, posting the first of his three career 40-win seasons with a final record of 42-20-11-10 with a sparkling .923 save percentage and 2.07 goals against average. While obviously those numbers prove that Kiprusoff was an integral part of the Flames’ biggest post-lockout success, they are accentuated when considering that the Flames sported the 3rd worst offence in the League that season, managing only 218 goals. This was the lowest amount scored by any team to make the playoffs last year and the next closest playoff team in terms of offence was the New Jersey Devils, who scored 242. While the following seasons would not be as dominate as 2005-2006, Kiprusoff played well enough to maintain his status as an elite NHL goaltender which put to rest the concerns that his superhuman efforts in 2004 and 2005-2006 were not simply flash-in-the-pan play from a hot goaltender. Despite this, criticism of Kiprusoff’s faltering numbers was fairly vocal. In 2007-2008 and 2008-2009, for example, his save percentage fell to .906 and .903 respectively. Despite the brief fall in his personal numbers, the Flames managed to make the playoffs in both seasons and Kiprusoff himself put together the two highest win totals of his career- 39 and 45 while appearing in 76 games both seasons. In fact, including this most recent 2011-2012 campaign, the Flames superstar has never recorded less than 35 wins in a full season. The number 35 is also significant for another reason as this is the age in which Kiprusoff will enter the 2012-2013 season and he will turn 36 at the end of October. While the recent shelf life of goaltenders provides some solace for fans, as Dwayne Roloson and Martin Brodeur have managed to continue to play high level despite being much older, neither of those goaltenders have played as much as Kiprusoff in recent years. Even Brodeur, a mainstay in the Devils crease since the early 1990s, has had a break in the form of an injury-shortened 2008-2009 season when he only appeared in 31 games. Furthermore, Brodeur hasn’t cracked the 60-game barrier the last two seasons appearing in 56 and 59 contests. As such, it is absolutely essential for Kiprusoff to maintain his high level of play while likely appearing in another high volume of Flames games. This is subject to change, given how much faith the yet-to-be-named coach has in either Leland Irving or Henrik Karlsson in the backup position. What is certain is that, barring injury, Kiprusoff will once again be relied upon and receive the bulk majority of the net minding starts in Calgary. If the Flames are going to return to the playoffs, he will once again need to be their best player and perform as such, which is precisely what he has done for the better part of a decade.